It was the first day of second grade. My older sister Linda, then eight years old, was wearing a blouse and a blue skirt with two pockets in the front. One pocket was heavy with coins, just enough to pay for her lunch. She had already made a new friend, Sarah, who was leading her through the lunch line. As they made their way toward the cafeteria lady, my sister pulled the coins from her pocket. She stopped, and counted the coins. She was missing a quarter. Frantically, she counted the money again, but the total was the same. Still one quarter short. A feeling of dread started to come over her. All she wanted was to eat her lunch, but she didnâ€™t have enough money to pay for it. The lunch lady was staring at her, and Sarah was staring too. My sister looked from one face to the other, and burst into tears. The frustration was too much to handleâ€”there were so many thoughts in her head, so many emotions she wanted to express, but she couldnâ€™t find a single word to explain her predicament. 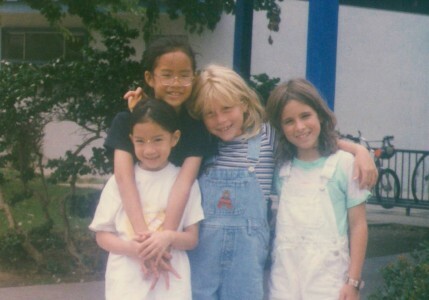 Her Mandarin Chinese vocabulary was useless at her public elementary school in Costa Mesa, California. 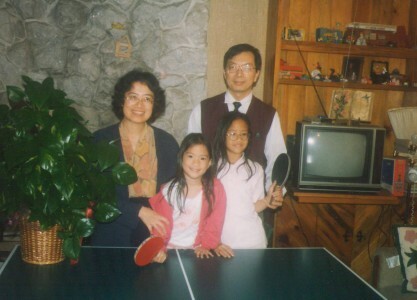 Although Linda and I were born in the States, our family moved to Taiwan when I was two months old, and we didnâ€™t return to the U.S. until I was six. At that time, we had only attended school in Taiwan and could barely speak any English. Linda was absolutely alone in her misery, isolated by a language barrier that prevented the concerned adults around her from being able to solve the simple problem. So she continued to cry, until finally, she was taken to the principalâ€™s office, which notified our mother, who then brought her home. Meanwhile, I was having similar problems in kindergarten. My shyness at that age was accentuated by the fact that there was an invisible wall between the rest of the children and myself. After spending the day as a silent observer during playtime, I came home and asked my mother how to say, â€œCan I play with you?â€ in English. Today, 16 years later, my sister and I speak English effortlessly, without any traces of an accent. As we grew up, we shed our distant Taiwanese childhoods, and quickly adopted the identity of second-generation Taiwanese Americansâ€”teasing our parents for the way they pronounced simple words like â€œvanilla,â€ and wishing my mom would, just once, make tacos for dinner. My non-Asian friends would marvel at our bilingual conversations, in which our parents spoke to us in Chinese and we replied solely in English, complete with a colorful variety of American teenage slang. Our family, a few years after we returned to the U.S.
My sister and I thought our parents were the â€œimmigrants:â€ they had moved to the U.S. as poor graduate students, without the financial or emotional support of having family close by. They fought to make a place for themselves in the workplace, in spite of employers who were skeptical of their accented English and coworkers who mistook their meek demeanor as a sign of lack of ambition. Our transition was much less difficult in comparison. Sometimes, itâ€™s easy to forget that Linda and I are immigrants as well, and we that experienced the same feelings of being excluded and misunderstood. The foundation laid by our parents created a safety net for us to rely on as we encountered similar struggles, softening the blow of hardships that came our way. Iâ€™m grateful for all the wisdom my parents have imparted to me. Their steadfast confidence in our ability to adapt and growâ€”regardless of our cultural upbringing, or even our English skillsâ€”is both a comfort and an inspiration.